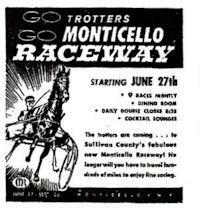 Monticello Raceway is a half mile harness track located in the town of Monticello, which is about 100 miles northwest of New York City. Opened in 1958, the track was converted to a racino in 2004. The track has a glass enclosed grandstand and clubhouse, which can seat 5,000. There are stalls for about a 1,000 horses and parking for 5,000 cars. Nestled in the Catskill Mountains of New York Monticello Raceway is a half mile Standardbred track converted into a Racino that offers year round racing. Nicknamed the Mighty-M, Monticello was not always mighty. I visited Monticello in the mid seventies and compared to the New England tracks it was mighty, it was fairly new, had a large crowd and a bright yellow hub. It took thirty years or so till I would return and what a difference. The crowds were gone, the yellow hub was gone, the place needed work. Then came the racino and it was mighty again. Well the casino part anyway, where the few racing fans end up it still looks the same at least they fixed most of the fencing around the track. If	you watch the movie Woodstock you will see a segment of Monticello locals being interviewed about the concert, if you look closely you will notice one man clutching his rolled up Monticello Raceway program. In 2011 Monticello ran it's usual Monday to Thursday year round schedule. Bruce Aldrich Jr. captured the driving title. Racing resumes year round in 2012. As I mention above back in the seventies, Monticello seemed quite the place, I remember a Howard Johnsons across the street from the track being packed the day I went. I believe it's remnants are still there, at least some structure is there, rotting away like everything else but should anybody care? I returned to Monticello in the fall of 2015, I rode the same small elevator to the third floor, where 'live' racing and simulcasting where going on. I remember when I did a few dog shows, on this very floor right before it became a racino and it all looked the same, even the number of people sitting in the grandstand when there was no racing. Check out the photo page, there wasn't much live about it, ten minutes to race one and I was one of five people there. Is this the future, does anybody need to be there? for myself I just wanted to snap a few pictures, I didn't even watch a race. The bottom line, the casino helps purses and it looks like off track betting and online gaming sites provide enough income to keep the horses running around the track, at least for now.